Designed to deliver stylish comfort, this Realspace big and tall desk chair has the support and stability you need to finish off your to-do list. The adjustable design allows you to find just the right height and tilt to suit your needs. Overall Dimensions: 44 1/8in. to 47 1/4in.H x 28in.W 31 1/2in.D. Realspace big and tall chair is weight capacity tested to support 350 lb. Lumbar feature supports your lower back and enhances the natural curve of your spine. Waterfall seat cushion slopes slightly downward to help reduce stress on your legs. 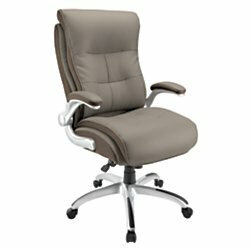 This taupe office chairs bonded leather upholstery creates a luxurious look and feel. Deep, layered body pillows and coil spring technology cushion you in comfort. Adjustable height allows you to find the ideal seating position. Adjustable tilt, tilt tension and tilt lock suit your preferences. Soft, padded armrests allow you to reduce strain on your arms and shoulders. Arms flip up when not in use, so you can move freely. Dual-wheel casters let you glide from task to task. Meets and/or exceeds ANSI/BIFMA performance standards. Assembly required.